Adoptive Benefit is a payment made to an adopting mother or a single male who adopts a child. The Department of Social Protection are responsible for determining the amount of adoptive benefit payable to an employee. 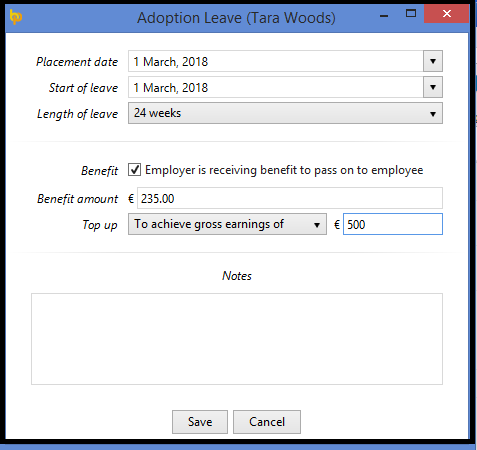 An employer is under no obligation to pay the employee while off on adoptive leave. Statutory Adoptive Benefit is paid for a continuous period of 24 weeks from the date of placement of the child. An additional 16 weeks unpaid leave can also be taken by the employee. Adoptive Benefit is taxable for all claimants. As with all Department of Employment Affairs & Social Protection (DEASP) benefits, it is not subject to USC or PRSI. Adoptive Benefit is taxed by Revenue, Revenue simply reduce an employee's tax credits and standard rate cut off points. Employers will be advised of the adjusted tax credits and cut off points on employer tax credit certificates (P2Cs). Therefore, it is important that employers import/apply the new Tax Credit Certificates/P2Cs immediately upon receipt. Employers do not make any additional adjustment to attempt to deduct tax from the Adoptive Benefit payments issued by DEASP. 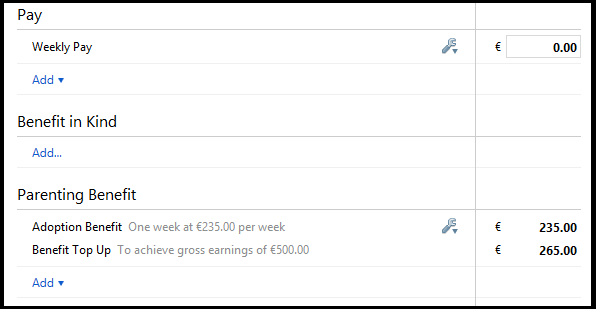 1) Click ‘Payroll’ on the menu bar and select the relevant employee’s name in the summary view. 2) Within the ‘Parenting Benefit’ section on the employee’s payslip, click on 'Add'. 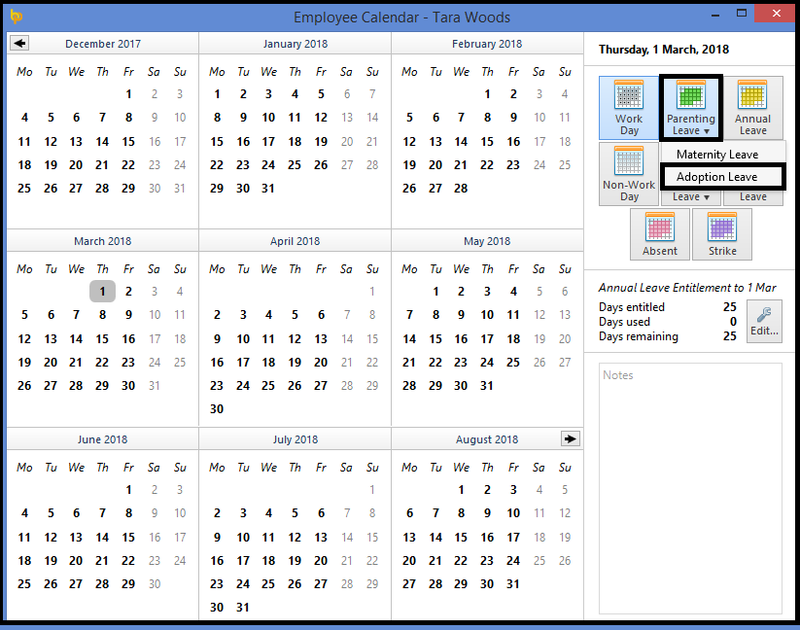 3) Click on the expected placement date of the child and press 'Parenting Leave' > 'Adoption Leave' at the top right of the calendar. 4) Enter the start of leave date and select the length of leave from the drop down menu. 5) If the employer will be receiving the Adoptive Benefit to pass on to the employee, tick the box provided to indicate this and enter the periodic benefit amount. 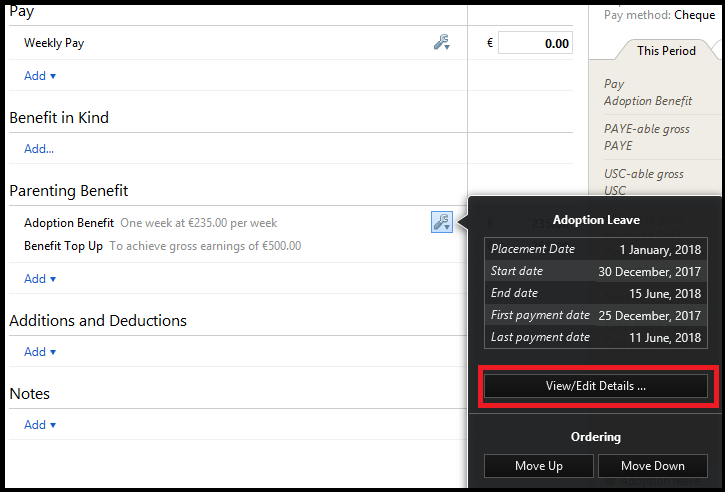 6) From the drop down menu, select whether the employer will be topping up the adoptive benefit with any pay. If topping up, first ensure that any pay items already entered on the employee's payslip are zero-ised first, then select whether you will be topping up by a fixed amount or to achieve a gross earnings total. Enter the amount of the top-up accordingly. 7) Enter any additional notes, as desired, and click 'Save'. 8) Close the calendar to return to the employee's payslip. Any adoptive benefit to be accounted for will be automatically displayed on the affected payslip of the first due benefit payment date. 9) To view/ edit the adoptive leave details at a later stage, simply click the Edit button within the DSP Parenting section, followed by 'View/Edit Details'. The original entry will be displayed, simply amend the entries and 'Save' if required.